The Twelve Days of Manganiello! Christmas is coming, the goose is getting fat…but you know who’s not? Joe Manganiello! Why? Because he has a brand new fitness book out, called EVOLUTION! Now, we at XOXOAD are not necessarily the most fitness-minded bunch, but we are motivated by pictures of handsome, scantily-clad gentlemen–something EVOLUTION has in spades. 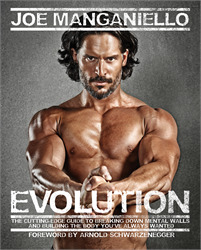 So, for the next twelve days, please enjoy a brand-new Joe Manganiello picture–it’s our gift that keeps on giving. And to make sure that the Joe-ho-hos last all the way to the holidays, we’re wrapping the whole thing up with an amazing Joe-themed giveaway. Make sure to come back on Monday, December 16 for all the details of how you can enter to win a signed copy of EVOLUTION, a set of True Blood DVDs, and more! For the second day of Christmas…? The best holiday gift I could ask for. How is the heat meter not at five fire balls?! I’m really excited about the next 12 days of my life. I would love to be touching that rock hard body of his I would die and go to heaven.